Since 1957, Vistage has been bringing together successful MDs, CEOs, executives and business owners into private advisory groups. Each group is purpose-built to help members help each other improve the performance and outcomes of their businesses. In our groups, about a dozen executives (like you) meet once a month to solve problems, evaluate opportunities and work on an assortment of strategic and operational issues. Our 21,000 members around the world represent a wide range of industries and a variety of backgrounds. An expert guides the meetings. Put twelve or so high performing business executives in a room and the potential is enormous. The role of a Vistage Chair is to ensure that every bit of experience and wisdom is applied in each Vistage meeting. Our Chairs are accomplished leaders (many are former MDs or CEOs). They are part facilitator, part coach and are committed to the success of their group members. The group digs deep. Thinly reasoned conclusions have no place in a Vistage group, the hallmark of our groups is something we call Issue Processing. It’s a structured, thorough and efficient approach to helping members think through the dynamics of a challenge. It forces you to push beyond your assumptions and get to the real issues. That’s critical to understanding and evaluating your options before making a decision and taking action. The process is a bit like working on a post-graduate business case in real time. Only the subject is you and your business. The topics can be intense. When you own or run a business, even the simplest decisions can have profound implications. In a Vistage group, no topic is off limits. If you are willing to talk candidly about the tough decisions you face, fellow members will rally around you, listen, ask tough questions and bring to bear every resource they have to help you solve problems and seize opportunities. Whether the question is operational, financial, legal, structural or even personal, your Vistage group is a confidential forum of experienced executives who rely on each other for wisdom, advice and counsel. Ideas and answers start to flow. With the wealth and diversity of experience Vistage members bring to their groups, chances are someone has grappled with the situations you are facing right now. And because members thrive on exchange, discussions get very interesting, very quickly. As you work together, you and your group start to develop a range of options and solutions that can only come from a team of business professionals working toward one another’s success. This is not your standard industry group. There is a thoughtful energy in a Vistage meeting that is hard to describe. But once you’ve experienced it, it’s impossible to forget. Then it happens. The work pays off. Through facilitated discussions with knowledgeable executives, you’ve turned “What to do?” into “What to do.” You’ve gained perspective and good advice and developed a definitive action plan—all in one day (along with a few sandwiches). Equally valuable, your group will follow your progress. In your next meeting, count on members asking if you advanced your plan. There’s another outcome you might not have expected. You helped other members immeasurably with your experience and insight. 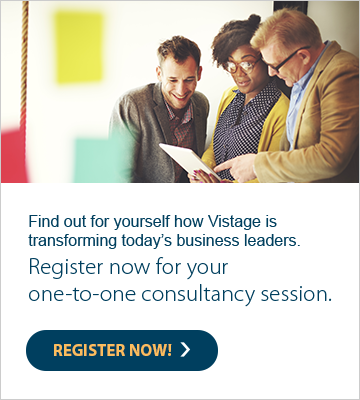 Members tell us that can be one of the most fulfilling parts of being part of Vistage.